An array of financial technologies—referred to by their shorthand “fintech”—is credited with the potential to solve issues of financial access. Fintech leverages online and digital technologies, and is poised to transform where, when, and how households can deposit paychecks, pay bills, send money, or retrieve credit scores—and to expand access to households and communities that have been historically excluded or marginalized. In the process of expanding access, fintech may also dilute any negative effects from communities’ lack of financial services. At the same time, unequal fintech landscapes threaten to undermine its potential for expanding access. Communities have varying rates of high-speed internet access, and many households experience disruptions in their phone and internet service. Lower-income households could lose access to financial services and their money when their phone or internet service is disrupted. Moreover, lower-income communities tend to have lower-than-average rates of owning or using these digital and financial technologies. 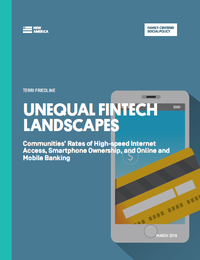 This report presents data on fintech landscapes in US communities, including high-speed internet access, smartphone ownership, and online and mobile banking. The descriptive findings contribute to growing conversations on the relationships between fintech, brick-and-mortar financial services, communities’ demographics like race and poverty, and urban and rural geographies. The findings reveal whether and how fintech can expand access to financial services, under what conditions, and the communities that may benefit the most. Communities have unexpectedly low rates of high-speed internet access, smartphone ownership, and online and mobile banking, suggesting that fintech may not currently be compensating for limited access to financial services. These low rates also suggest that fintech has plenty of room to expand. In the average community, 67% of adults have high-speed internet access in the home and 40% own a smartphone. Far fewer adults in the average community use online and mobile banking to make financial transactions. Thirty-one percent have used online banking and only 8% have used mobile banking at any time in the previous year. Unequal fintech landscapes disadvantage poor white communities and communities of color. In other words, communities with higher percentages of poor households—especially at intersections of race and urban and rural geographies—have lower rates of accessing or using fintech. 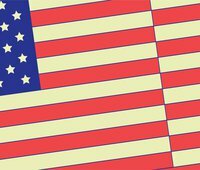 Fifty-eight percent of adults in high-poverty rural communities have high-speed internet in their homes, compared to 73% in low-poverty rural communities. Smartphone ownership has the smallest percentage point gaps between demographic groups. For example, 41% of adults from high-poverty Latinx communities and 46% from low-poverty Latinx communities own smartphones. Twenty-two percent of adults from high-poverty black communities have used online banking in the previous year, compared to 39% of adults from low-poverty black communities. While average mobile banking use is low across all demographic groups, rates are higher among low-poverty communities. Adults' mobile banking use in the preceding year ranges between 9% and 12% in low-poverty rural and urban communities, respectively. National trends in fintech and the concentration or density of financial services mask disparities in access that are prevalent in local communities. Nationally, the density of banks and credit unions is higher in communities where fintech is lowest. This suggests that communities' financial services reflect their fintech needs, and equally serve communities of color, poor white communities, and rural communities. However, the opposite is often true at local levels. For example, Chicago communities with the highest rates of high-speed internet access have a density of bank or credit union branches that is 11 times higher than communities with the lowest rates of high-speed internet. Low-poverty black communities in Chicago have a density of bank or credit union branches that is 5 times higher than high-poverty black communities.